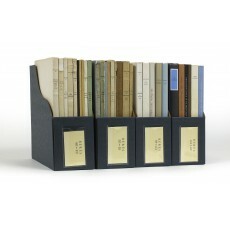 Fifty-six volumes (26 cm), as issued, in the publisher’s bindings. 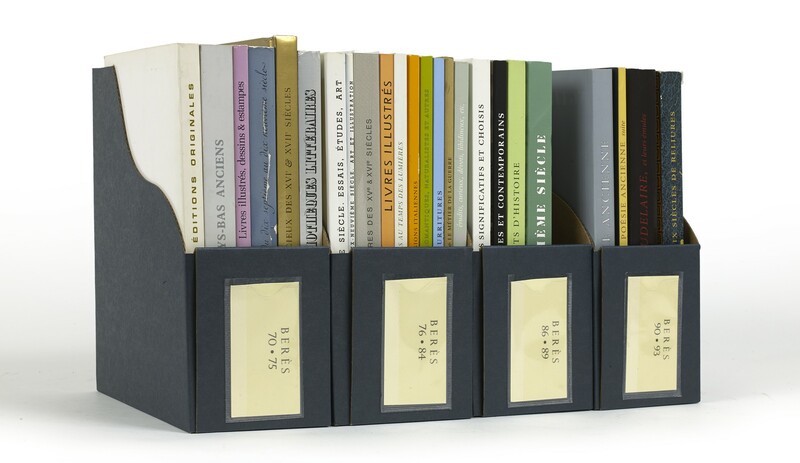 - An unbroken run 1947-2005 of the principal series of catalogues issued by Pierre Berès (a lesser series of 112 “Bulletins” was published May 1958-December 1967; and three “Circulaires” were distributed in 1954). For publication dates and other details, see Dominique Coq, Bibliographie exhaustive des catalogues Pierre Berès (Paris 2006). Offered with one stock catalogue, hors série (1980). ¶ Good, unmarked copies. 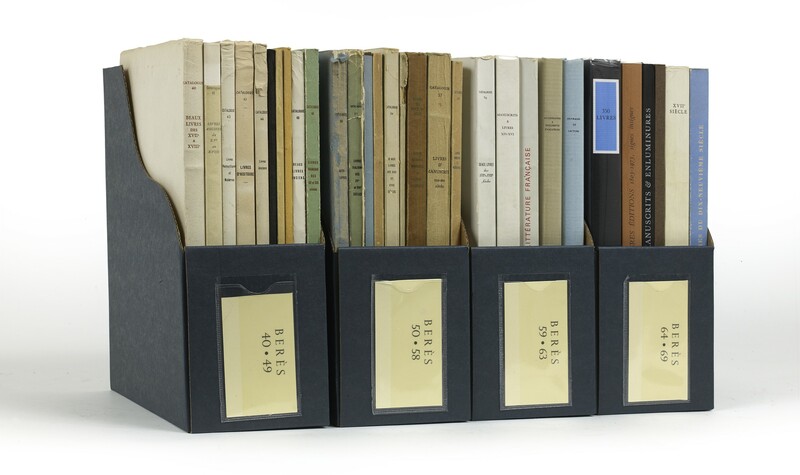 ● Catalogue 42 (Supplément), Catalogue 85, and the catalogue hors série are inadvertently omitted from our photograph. (26 cm), 160 pp., colour frontispiece, illustrations. 351 items; priced. Publisher’s printed wrappers. (26 cm), 176 pp., frontispiece, illustrations. 661 items; priced. Publisher’s wrappers. ¶ Retaining fragment of original glassine wrapper. Two volumes (26 cm), I: 108 pp., frontispiece, illustrations. 507 items; priced. II: 62 pp. Items 508-1130. Publisher’s wrappers. - For the supplement, see Domnique Coq, Bibliographie exhaustive des catalogues Pierre Berès (Paris 2006), p.4. ¶ Spine of Supplément damaged. (26 cm), 176 pp., frontispiece, illustrations. 1250 items; priced. Publisher’s wrappers. (26 cm), 84 pp., illustrations. 320 items; priced. Publisher’s wrappers. (26 cm), 58 pp. 343 items; priced. Publisher’s wrappers. (26 cm), 70 pp., illustrations. 747 items; priced. Publisher’s wrappers. (26 cm), 96 pp., illustrations. 711 items; priced. Publisher’s wrappers. (26 cm), 100 pp., illustrations. 312 items; priced. Publisher’s wrappers. (26 cm), 118 pp., illustrations. 260 items; priced. Publisher’s wrappers. (26 cm), 135 pp., illustrations. 635 items. Publisher’s wrappers. ¶ Wrapper worn across the back. (26 cm), 116 pp., illustrations. 273 items; priced. Publisher’s wrappers. ¶ Wrapper worn, damaged across the back. (26 cm), 83 pp., illustrations. 166 items; priced. Publisher’s wrappers. (26 cm), 85 pp., illustrations. 445 items; priced. Publisher’s wrappers. (26 cm), 116 pp., illustrations. 307 items; priced. Publisher’s wrappers. (26 cm), 54 pp., illustrations. 110 items; priced. Publisher’s wrappers. ¶ Wrapper worn across the back. (26 cm), 180 pp., illustrations. 691 items; priced. Publisher’s wrappers. (26 cm), 248 pp., illustrations. 345 items; priced. Publisher’s wrappers. (26 cm), 126 pp., illustrations. 596 items; priced. Publisher’s wrappers. (26 cm), 180 pp., 119 illustrations. 272 items; priced. Publisher’s wrappers. (26 cm), 187 pp., illustrations. 165 items; priced. Publisher’s wrappers. (26 cm), 171 pp., 107 illustrations. 497 items; priced. Publisher’s wrappers. (26 cm), 78 pp., 108 illustrations. 220 items; priced. Publisher’s wrappers. (26 cm), 152 pp., illustrations. 650 items; priced. Publisher’s wrappers. (26 cm), 290 pp., illustrations. 350 items; priced. Publisher’s wrappers. (26 cm), 108 pp., illustrations. 544 items; priced. Publisher’s wrappers. (26 cm), 111 pp., 38 illustrations. 49 items; priced. Publisher’s wrappers. (26 cm), 78 pp., 38 illustrations. 46 items; priced. Publisher’s wrappers. [Stock catalogues, numbered series: 68] Livres du dix-neuvième siècle [other title:] Editions originales, livres illustrés, albums et suites de gravures, livres avec dessins originaux, reliures mosaïquées et décorées, manuscrits autographes, livres d’enfants, histoire naturelle, littérature, histoire, voyages, costumes; provenant, pour la plupart, de collections célèbres: Duchesse de Berry, Duc d’Orléans, Duc de Chartres, Robert Hoe, Descamps-Scrive, Beraldi, etc. (26 cm), 196 pp., 98 illustrations. 384 items; priced. Publisher’s wrappers. (26 cm), 278 pp., 250 illustrations. 514 items; priced. Publisher’s printed wrappers. - Issued “A la mémoire de Georges Heilbrun, grand libraire.” Contains books from the libraries of Frédéric Lachèvre (1855-1943) and Alphonse Willems (1839-1912), the bibliographer of the Elzevier press. The dedication copy of Lemaistre Les Plaidoyez (1657) bound for Nicolas II Pompone de Bellièvre by Florimond Badier was bought by Paul Getty. Noticed in The Book Collector, Winter 1977, pp.571-575. (26 cm), 200 pp., 200 illustrations. 925 items; priced. Publisher’s wrappers. (26 cm), 258 pp., 213 illustrations. 261 items; priced. Publisher’s wrappers. (26 cm), 310 pp., 91 illustrations. 314 items; priced. Publisher’s wrappers. (26 cm), 232 pp., 90 illustrations. 432 items. Publisher’s wrappers. ¶ Binding cracking down spine. (26 cm), 180 pp., illustrations. 161 items; priced. Publisher’s wrappers. (26 cm), 256 pp., illustrations. 859 items; priced. Publisher’s wrappers. [Stock catalogues, numbered series: 76] Dix-neuvième siècle : essais, études, art [other title:] Livres illustrés, reliures, collections d’œuvres, mémoires, botanique, chasse, histoire naturelle, Napoleonica, topographie, voyages, etc. (26 cm), 158 pp., illustrations. 370 items; priced. Publisher’s wrappers. (26 cm), 36 pp., illustrations. 39 items; priced. Publisher’s wrappers. (26 cm), 208 pp., 140 illustrations. 106 items; priced. Publisher’s wrappers. (26 cm), 136 pp., 119 illustrations. 194 items; priced. Publisher’s wrappers. (26 cm), 120 pp., 83 illustrations. 150 items; priced. Publisher’s wrappers. (26 cm), 86 pp., 300 illustrations. 136 items; priced. Publisher’s wrappers. Publisher’s wrappers. (26 cm), 119 pp., 56 illustrations. 260 items; priced. Publisher’s wrappers. (26 cm), 101 pp., 75 illustrations. 136 items; priced. Publisher’s wrappers. (26 cm), 76 pp., 41 illustrations. 100 items; priced. Publisher’s wrappers. [Stock catalogues, numbered series: 84] Livres badins, érudits, curieux, dévots, libidineux, etc. (26 cm), 256 pp., 111 illustrations. 904 items; priced. Publisher’s wrappers. - Noticed in The Book Collector, Winter 1994, pp.565-566. (26 cm),  pp., 300 illustrations (some in colour). 350 items. Price list loosely inserted. Publisher's printed wrappers, pictorial dust jacket. - "Exposition de 350 livres & manuscrits du 19 décembre 1994 au 28 janvier 1995". (26 cm), 200 pp., illustrations. 109 items; priced. Publisher’s wrappers. - Noticed in The Book Collector, Spring 1996, p.104. (26 cm), 136 pp., illustrations. 209 items; priced. Publisher’s wrappers. (26 cm), 280 pp., illustrations. 650 items; priced. Publisher’s wrappers. (26 cm), 366 pp., illustrations. 1265 items; priced. Publisher’s wrappers. (26 cm), 200 pp., illustrations. 706 items; priced. Publisher’s wrappers. (26 cm), 96 pp., illustrations. 138 items; priced. Publisher’s wrappers. - Early books, from the 1557 Aeschylus to 1590 Tasso; “the clou was the 1526 Homer in modern Greek in an original alla greca binding” (notice in The Book Collector, Winter 2000, p.559). (26 cm), 408 pp., illustrations. 1131 items; priced. Publisher’s wrappers. (26 cm), 316 pp., illustrations. 283 items; priced. Publisher’s wrappers. 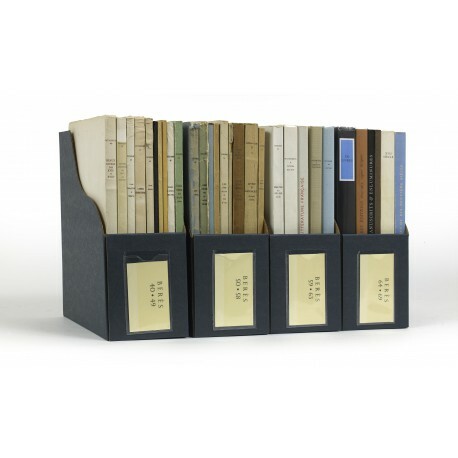 - “This is not just a catalogue; it is a fundamental work of reference for all students of bookbinding. Buy it now. It will only get more expensive” (from a notice in The Book Collector, Spring 2005, pp.97-98). ¶ Few pencil annotations; binding cracking down spine. (26 cm),  pp., illustrations. items; priced. Publisher’s wrappers.